This article was originally published on January 8, 2018 by Lehigh Valley Business. A little-known name in the automotive industry, Bethlehem Township-based Orio North America has a lofty mission – to keep Saab cars from going the way of the dinosaur. It’s a mission born in June 2012 when Orio North America opened, about six months after Saab Automobile, a global brand based in Sweden, went out of businesses. Today, Orio North America is the exclusive supplier of Saab original parts for the United States and Canada. Tim Colbeck, Orio North America president and CEO, said his company’s story is rare. Orio North America is wholly owned by Swedish parent company Orio AB, which is wholly owned by the Swedish government’s finance ministry. That means that Orio North America has sister companies in nine other countries around the world, with the U.S.-based firm covering the largest market, the U.S. and Canada. Today, largely because of that effort, there are more than 200 Saab service centers in North America. Thanks to the dealer network that Orio put in place, Saab owners in need of a car repair have an experience much like any other car owner, according to Colbeck. “They can look up the nearest service center – in the Lehigh Valley it would be Scott Family of Dealerships [in Salisbury Township] – and go there for service,” he said. Scott had a Saab franchise for more than four decades, said David Dumpel, parts director at Scott. Colbeck said Orio North America also works with independent repair shops that work on Saab cars. Today, there are still nearly 400,000 Saabs on the road in the U.S.
“It is surprising, since there were predictions about how Saab ownership would decline, but people are holding onto their Saabs,” Colbeck said. The Saab resale market helps maintain the need for repairs. Robert R. Pandaleon of Allentown, a self-described “Saab convert,” bought his first Saab about seven months ago – a 2004 9-3 – after owning a variety of European brands including Volvo, BMW and Porsche. He said that he had always had an interest in Saab, and that in the mid-1980s he tried to talk his father into buying a 9-3. Pandaleon said he uses Scott to service his Saab, affectionately dubbed the Guppy. Colbeck said there is a natural avenue of growth for Orio beyond Saab: supporting other car lines, particularly European vehicles. “It is a good match and synergy for our customer base,” Colbeck said, since the type of customer that owns a Saab is likely to own other European cars. Plus, mechanics certified to repair Saabs typically specialize in other European makes. This is especially true of independent repair shops, Colbeck said, with Saab and Volvo repairs tending to be done by the same technicians. As a result, Colbeck said, Orio North America plans to start offering Volvo parts nationwide in the first half this year. Orio will roll out the new service nationally in much the same way as its existing business model. 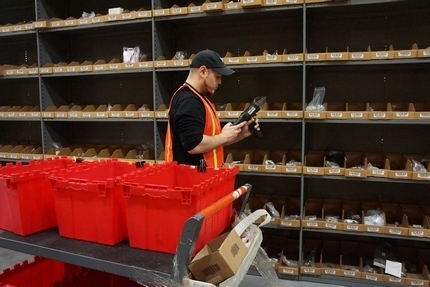 The Orio parts warehouse is in Lower Nazareth Township, which means the company can deliver parts overnight by truck from “the tip of Maine down to Virginia and out to Detroit,” Colbeck said.